Pacific Northwest native Dale Chihuly couldn't have picked a better location for Seattle's newest must-see attraction, Chihuly Garden and Glass, which opened May 21. Located at the base of the Emerald City's iconic Space Needle, this expansive, colorful collection of Chihuly masterworks gives visitors an opportunity to marvel at creations from every decade of the artist's storied career. Treated to a preview, I was pleased by the breadth of the exhibit. I've seen a few of Chihuly's works in person before — such as his massive, opulent, swooping chandeliers — but to see such variety spread over a 1.5-acre, indoor/outdoor grounds was breathtaking. Even from the outside, there's enough colorful glass to illuminate a gray Pacific Northwest day, or to serve as a gorgeous nighttime beacon. 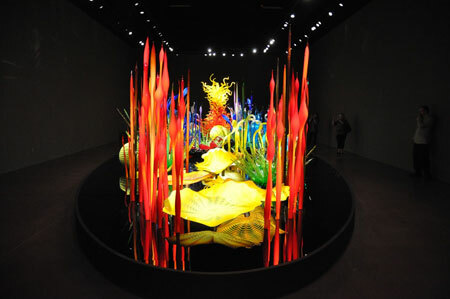 Chihuly Garden and Glass is a long-term installation, according to exhibition executive director Michelle Bufano. It contains 10 different displays, a movie theatre showing Chihuly's team of artists at work, and a quirky café, featuring local fare served atop the artist's favorite collectables. Born in 1941 in Tacoma, Wash., Dale Chihuly's work is included in 225 museum collections worldwide, as well as special installations in Venice, Jerusalem, London and Chicago. The new collection in Seattle samples some of his more famous works: Cylinders and Baskets from the 1970s; Seaforms, Macchia, Venetians, and Persians from the 1980s; Niijima Floats and Chandeliers from the 1990s; and Fiori from the 2000s. Chihuly's glass artistry evokes ice, fire, space, nature and whimsy; one of the aspects I enjoyed the most is exhibit's layout, which provided a new, dazzling surprise each time I rounded a corner. Visitors can purchase timed-entry passes up to 30 days in advance. Once inside, guests are offered earbuds to listen to a free mobile phone tour of the exhibit. The tour begins with "Glass Forest", one of Chihuly's earlier works in collaboration with artist Jamie Carpenter, which they created by dropping molten glass from stepladders. Glowing with neon from within, this forest of illuminated strands seems suspended on black reflective material — a key feature in many of his works. Moving into the Northwest Room, there's an unexpected departure from Chihuly's bold colors with a collection of smoky-brown Tabac Baskets arranged around Native American baskets. Surrounded by a collection of Edward Curtis photographs of Native Americans, blankets and other artifacts, the room is a testament to Chihuly's love for the region and his life on a boathouse on Washington's Lake Union. Frankly, I was both pleased and surprised by how accessible the pieces are and wondered if they're going to have people picking them up or, worse, knocking one over. Public relations director April Matson laughed and said that they already had a group of 300 schoolchildren come through for a preview with no problems. Still, while Chihuly Garden and Glass is mesmerizing attraction for the whole family, it would be an expensive misfortune to let little Johnny run amok. Next, the Sealife Room showcases a dazzling tower suggesting an ocean geyser full of sea critters. Rounding another bend, I entered the Persian Ceiling Room, with stacked pieces illuminated from above to create a kaleidoscopic landscape on all four walls. Mille Fiori. Photo credit: Deston Nokes. Next, the Mille Fiori, which is Italian for 1,000 flowers, is a glowing garden of glass set in the dark that will have guests (and this writer) running out of adjectives to describe its appeal. It leads nicely into another dark room aglow with boats filled with Ikebana and Japanese floats. The Macchia Flores, which means "spotted flowers" in Italian, are large bowls that cast a gorgeous reflection on the surrounding walls. Chihuly's mother refers to this gallery as "the uglies" for being too loud, but I found them enthralling. Again, lighting is a huge factor in the gallery's impact. The Glass House is one of the centerpieces of the property, reflecting the artist's love of conservatories, and is the site of one of Chihuly's largest suspended sculptures. At 100-feet long, it's an expansive explosion of Persian glass in reds, oranges, yellows and amber made up of 1,340 pieces. "I'm often asked if the sculpture has lights inside it, it's so brilliant, but it's all done with external lighting," Bufano said. "It literally took days to get the lighting set properly." Chihuly's accordian collection decorates Collection's Cafe. Photo Credit: Deston Nokes. 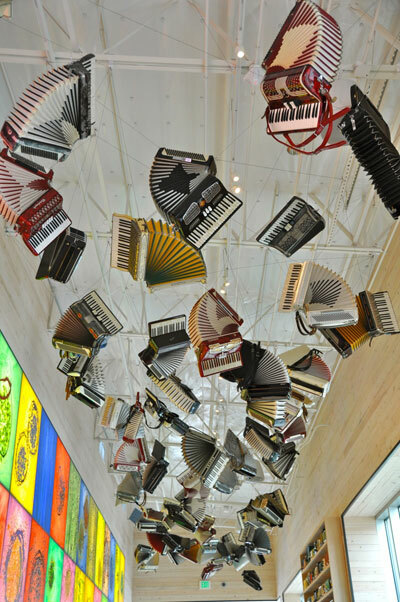 In the Collections Café, folks can enjoy a tasty meal under Chihuly's collection of accordions suspended from the ceiling. The menu features fresh Northwest ingredients, from razor clams and pepper-crusted ahi tuna sliders to burgers, pork chops, and sundried tomato and goat cheese ravioli. His collections, many under the glass-topped tables, are a fun and quirky mix of antique razors, fishing lures, transistor radios, shaving brushes and tin toys. On the walls are vintage bottle openers, colored chalkware from carnivals and fairs from the 20s and 30s, and other curiosities. It's best to reserve a table in advance through Open Table as it only accommodates 88 people at 23 tables. Not to be missed is the theatre, which runs four different five-minute shorts that portray the fire, breath, motion and muscle that goes into creating Chihuly's pieces. Due to a shoulder injury he sustained in the late 1970s, Chihuly no longer works as a gaffer, preferring to act as the director of a project. It's great theatre to see his team conjuring up his designs. My favorite section was exploring the grounds surrounding the Glass House. Mixed into the landscape are glass reeds, cattails and assorted orbs that fill the ground around towering pieces that are visible from the entryway. Most dominant is the 16-foot Seattle Sun, a gorgeous, round tangle of yellow and orange. Other pieces of note include the Rose Crystal and Green Icicle Towers. "It's also an incredible exhibit to view at night," Bufano said. "Not only are the gardens transformed, but the massive chandelier in the Glasshouse takes on a life of its own." As with most galleries, the path finally leads to a bookstore/gift shop that is well worth visiting for the simple browser and impulsive buyer alike. There are plenty of frivolous, fun keepsakes based on the artist's collectables, as well as higher-end souvenirs. There also are Chihuly pieces available for a demonstrably higher price. While admission to Chihuly Garden and Glass isn't cheap ($19 for general admission ages 13-64), the exhibit does provide a feast for the eyes you'd find hard to come by anywhere else. Deston Nokes is a travel writer based in Portland, Ore.